Bran is a grain that is incredibly high in fiber and relatively low in calories. It is perfect for adults, but great for kids as well because it has a lot of other good nutrients in it that little growing bodies need. 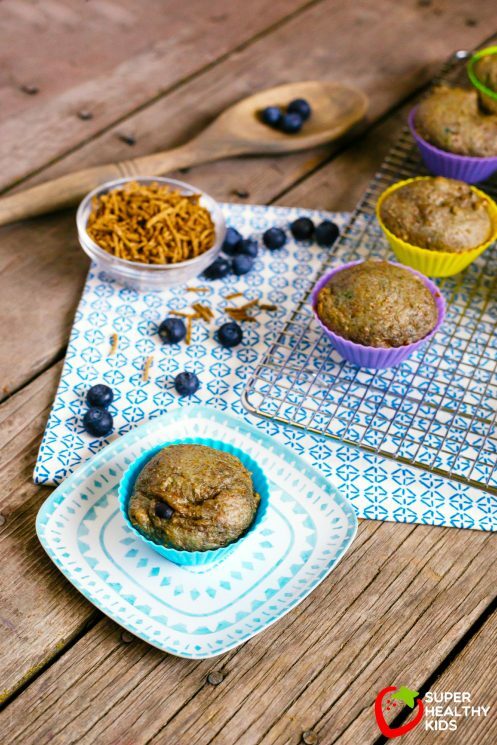 We like to add blueberries into these bran muffins to sweeten them up, and also add some fruit in our muffins. 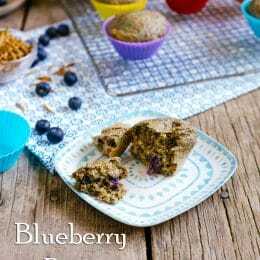 These Blueberry Bran Muffin Recipe are a great muffin to have in your recipe box to pull out and make whenever you want a batch of delicious and really healthy muffins. 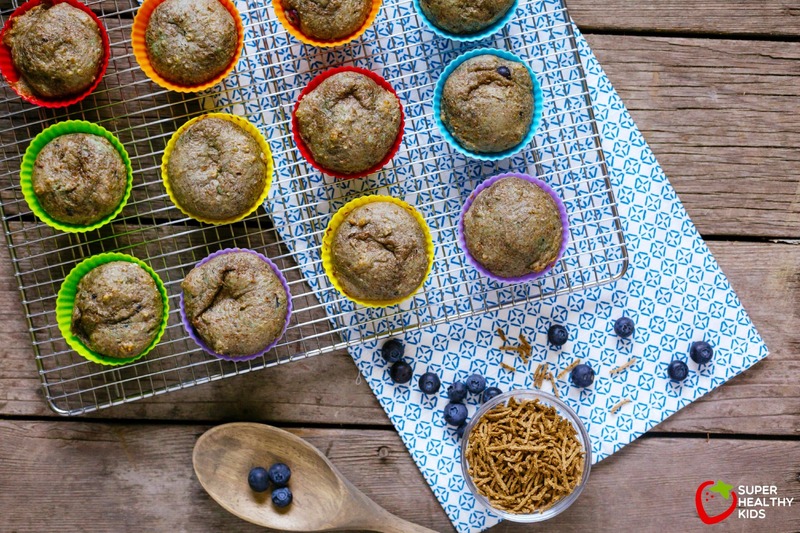 Muffins are one of our go-to breakfasts. They are nutrient dense, easy to eat and kids love them! 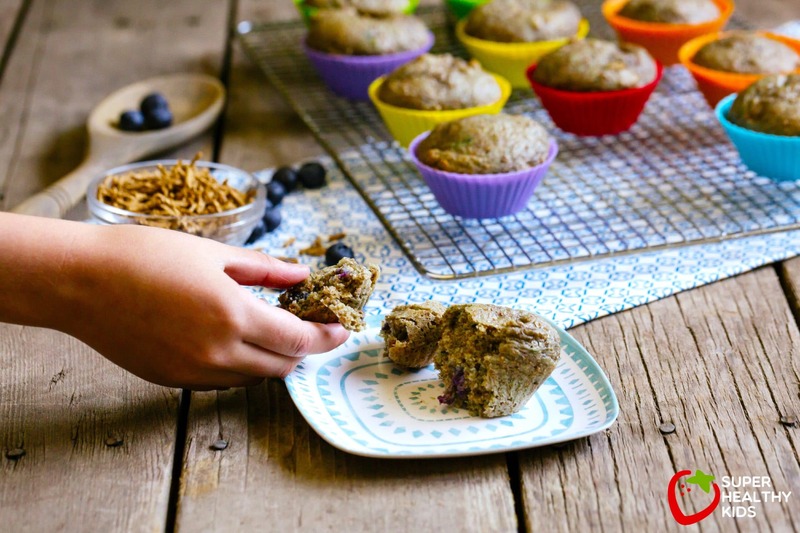 We are always looking for new muffins recipes, and experimenting with different ingredients and fruits to include. When you mix things up, even though we serve muffins often, our kids don’t get sick of them! There is just something so delicious about a warm muffin out of the oven. Add a little butter and let it melt into the center of the muffin and it seems like for a moment, nothing can go wrong for the rest of the day. We love using bran in our muffins because it is so hearty, but tastes slightly sweet and gives muffins a great texture. But what is bran?? Bran is the hard outer shell of the wheat plant. As the insoluble wheat bran passes through your system, it aids digestion, adds bulk to stools and prevents constipation. Bran is a good source of the B vitamins. Bran is a rich source of eight important minerals. 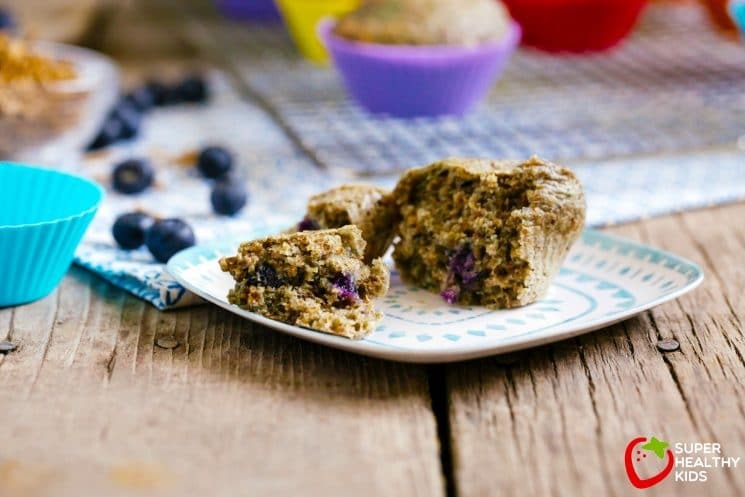 If you leave these muffins sitting out on the counter, you can bet on little hands sneaking a bite! These muffins will freeze great and then you can have them anytime. 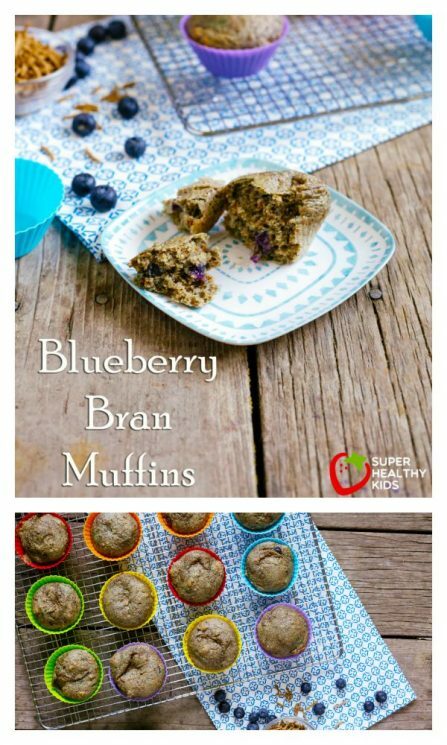 Just pop them in the microwave for 30 seconds per muffin and they taste just like they came out of the oven! 2. Let bran cereal soak in wet ingredients for 5 minutes. 3. Then add wet ingredients to dry. 4. Scoop batter into prepared muffin pan. 5. Bake at 350° for 12-15 minutes, or until muffins are cooked through. 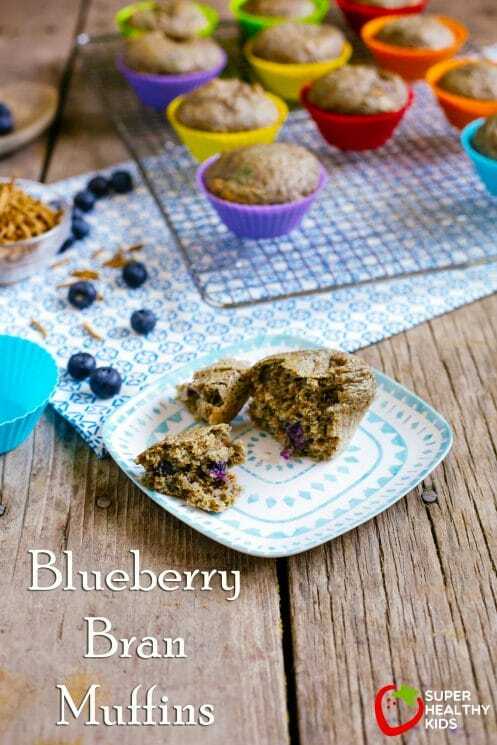 I lov blueberry muffins.. this is will be hot not only with the kids, but adults too!! Thanks for posting this delicious and healthy recipe! Wow! Love your blog! So many creative, healthy recipes! I’ll be adding your button to my blog. What a great blog! Thanks for the great ideas! What a delicious recipe! I look forward to sharing this with our fans. Thanks so much, Amy. My 13 month old daughter loves these!!! She tends to like lots of carbs so I try to get fruits and veggies in other ways. I used vanilla whole milk yogurt and 1/3 C defrosted frozen blueberries and they are really good!! Very sweet but it’s the natural sugar in the organic yogurt!! I only had vanilla yogurt so I reduced the sugar to 2 tablespoons. I also put in 1/2 C blueberries because I love them! The muffins were tasty. LadyB, you can choose any brand, I bought Kelloggs All-Bran! I just discovered your blog and love your recipes. Do you use bran flakes or do you crush them? Thanks! I used the bran found by in the cereal aisle! Like the cereal “All-Bran”, and I don’t crush it or anything. I just use it whole. It’s great in so many recipes! Wow,this is good healthy recipe.Thanks for sharing ! can i use smartchoice vegetable oil instead of canola? Yes Gail! Any liquid oil will work. I’ve been using grape seed lately and it’s fabulous. Any particular advice for making these ahead and freezing them? Thx! A great recipe. Hi is there a way to replace the bran with another common house hold item but still a healthy one? I’m allergic to bran cereal. HI Allie- I haven’t tried it with anything else, but if you do- please let us know what you used! Nothing special! After they bake, cool and then place in an airtight container and freeze! Hi Lindsay! It is one cup of cereal. I enjoyed the taste, it was really good. However, mine does not look like the picture as you can see. I think it has to do with the part where they said mkx all dry ingredients, then said let the bran cereal soak in the wet ingredients. The bran cereal is dry to i mixed it with the other dry ingredients before reading the next step. .